Compared to your average pregnant mother, a woman named Ani in Indonesia had a seriously rough delivery after going into the hospital to give birth to her son. She was a high risk pregnancy due to being 41 years old. She has diabetes, which puts her at risk for all kinds of problems. And, of course, there’s the fact that the bouncing baby boy she gave birth to weighed in at a staggering 19 pounds. (That ought to scare the pants off every expectant mother!) 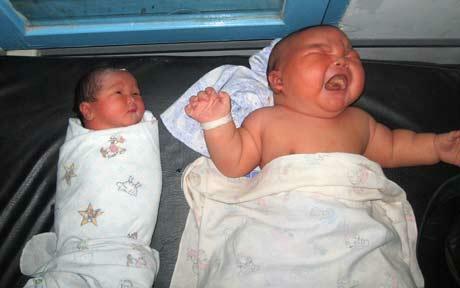 Ani’s still-nameless 19-pound son is the largest child born in Indonesia, passing a 15-pound baby was born in 2007. The world’s largest baby weighed in at 23 pound, was born in Canada in 1879, and lived only 11 hours after birth. Meanwhile, Ani’s new son is as healthy (and hungry) as a horse. He is also 24 inches long, but that is only slightly taller than normal. This whole story somehow makes the pregnant man and the dodecamom seem normal by comparison.